My post last Friday covered questions 5-9 on Kimberley Grabas’s “Brand Story Worksheet” found through https://thebookdesigner.com and on http://YourWriterPlatform.com. (In fact, I mistakenly gave Theresa Meyers credit for that worksheet. I sincerely apologize to Ms. Grabas, Ms. Meyers, and to my blog readers for my error. I republished the corrected blog post on November 28, 2016 at 10:22 pm Eastern Standard Time.) Using this worksheet was a beneficial exercise. It wasn’t easy or quick, but it was something I needed to do in order to figure out my author brand. Since Friday, I have designed my business card and ordered them. The new one has the same photo of me that appears on my Pinterest https://www.pinterest.com/janet5049, Twitter (https://twitter.com/janetmorrisonbk), and Janet Morrison, Writer (https://www.facebook.com/Janet-Morrison-Writer) accounts. It will take a little longer to change the picture on my website (www.janetmorrisonbooks.com) – which needs a lot of updating. Question 10 on the worksheet prompted me to start making a list of the actions I will take “to create loyal and meaningful relationships with my readers.” The types of things on my list include setting up a way for people to join an e-mail mailing list on my website, writing a newsletter, researching how other authors have done this, and make myself available for personal appearances and even Skype with book clubs. The personal appearances and Skype will have to wait until I actually have a novel to publicize. Question 11 addresses an author’s need to associate with other writers. The Queens Writers Group, of which I was a member after completing Judy Simpson’s fiction writing course at Queens University of Charlotte in 2001, disbanded upon Judy’s death. I have not joined another writers group. I probably should look for another group to join, as well as joining the Charlotte Writers Club and the North Carolina Writers Network. To date, money has stood in my way. The 12th question on the worksheet asks, “How does your brand story position you for future growth as a writer?” I think my story positions me to write southern historical novels in addition to the manuscript of The Spanish Coin – whether they be stand stand-alone books or sequels to The Spanish Coin. After answering the 12th question, the instructions are to write one’s brand story, concentrating more on how you say it than what you say. You’re supposed to think about how you’ll incorporate your story into your marketing plan – every aspect of that plan. This was a daunting task but, once I settled into it, my story and strategy came together fairly easily. I reviewed my responses to the 12 questions on Ms. Meyers’s worksheet, and my story quickly jelled. I will share my story and strategy on my blog on December 2, 2016. Although I had trouble translating my love for geographic maps to an author brand map, here’s my first attempt. It looks more like a chart than a map. 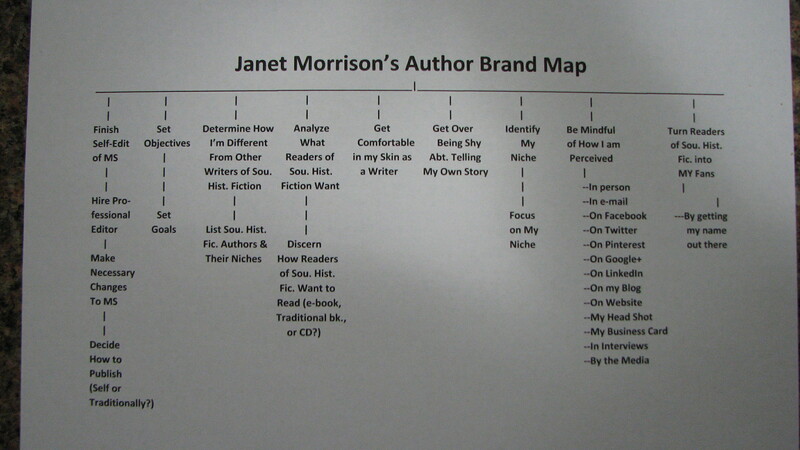 The important thing is for my map to make sense to me, even if it does not look like anyone else’s author brand map. I didn’t have an example to follow, so here it is. I hope you can read it. My attempt at an Author Brand Map. Explode a myth. . .
“Of these, Meyers continues, “exploding a myth gets the best response. . . . When pitching a producer or editor, in thirty seconds or less you need to hold up the myth and then shoot it down. As you can see, this part needs some work! This seems like a good place to end today’s blog post, since I’ve run out of answers. If you feel led to Tweet about my blog, Pin one of my posts on Pinterest, or comment about it on other forms of social media, I thank you for helping me get the word out about my writing. You’ll find social media icons below. Check out my blog on December 1, 2016 for the possible “reveal” of my three message points, my “sound bite”/reductive phrase or sentence, and my author brand story, and my strategy going forward. Until that next blog post, I hope you have a good book to read and, if you’re a writer, I hope you have productive writing time. Thank you for coming along on my journey as an aspiring novelist.